Also serving communities of Gonzales. The average cost of memory care in Baton Rouge is $4,543 per month. This is lower than the national median of $4,650. To help you with your search, browse the 2 reviews below for memory care facilities in Baton Rouge. On average, consumers rate memory care in Baton Rouge 4.0 out of 5 stars. Caring.com has helped 5 families in Baton Rouge find high-quality senior care. To speak with one of our Family Advisors about memory care options and costs in Baton Rouge, call (855) 863-8283. Baton Rouge, the French-influenced capital of Louisiana, is home to about 225,000 people, and about 12.7 percent of those are seniors over the age of 65. Three memory care facilities in the city cater to members of this aging population who have Alzheimer's disease or other forms of dementia. In Baton Rouge, as in all of Louisiana, licensed adult residential care facilities can be further designated as Alzheimer's Special Care Units (ASCUs) if they have a specific unit or programs dedicated to caring for patients with dementia and go through the requisite training to care for this population. Before accepting dementia patients at an assisted living facility, the staff must go through specific dementia care training. Baton Rouge is home to world-class medical facilities, including those specializing in brain health and dementia care such as Baton Rouge General, in the event of medical emergencies or illness. The hot, rainy and humid summers in Baton Rouge raise the risk of heat stroke for vulnerable seniors in the area, so any memory care facility you are considering should have plans to protect your loved one from high temperatures and major weather events. Mild winters let seniors enjoy time in a safe and secure enclosed outdoor area, which all Louisiana ASCUs are required to provide. Overall, the cost of living in Baton Rouge is close to the average for the entire country, with a rate of just 0.5 percent above the national average. Health care and transportation, two particular concerns for seniors and their families, are both higher than the national average. 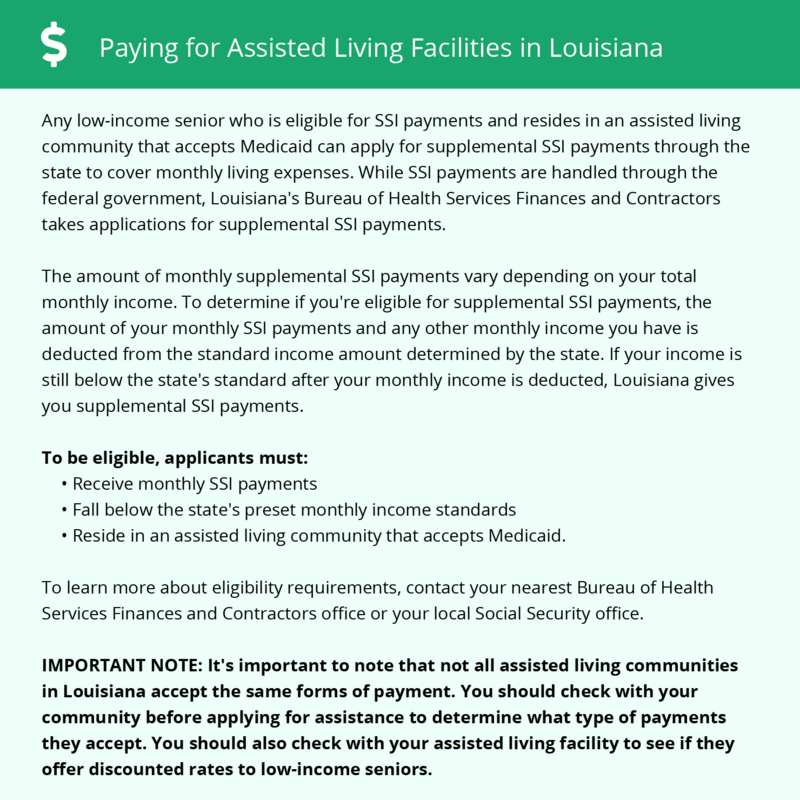 The state of Louisiana does not tax Social Security income or the income from public pensions, which may help some families finance memory care services. However, income from retirement savings accounts are taxed, which may be a consideration for families relying on this income to cover care. Memory Care costs in Baton Rouge start around $4,543 per month on average, while the nationwide average cost of memory care is $4,800 per month. It’s important to note that memory care rates in Baton Rouge and the surrounding suburbs can vary widely based on factors such as location, the level of care needed, apartment size and the types of amenities offered at each community. To see a list of free memory care resources in Baton Rouge, please visit our Assisted Living in Louisiana page. Baton Rouge-area assisted living communities must adhere to the comprehensive set of state laws and regulations that all assisted living communities in Louisiana are required to follow. Visit our Memory Care in Louisiana page for more information about these laws.